An alert about industrial pollution threatening the Chinese city of Harbin has cast the spotlight on the huge challenge China faces improving its water system, as the BBC's Nick Mackie reports from Chongqing. In the forested hills above the smoggy central Chinese city of Chongqing, a tiny brook trickles through the tall bamboo. It is called the Qingshuixi, or "pure stream". Among the trees, a metre-high concrete dam forms a pool that holds around a barrel of clear water. This is the reservoir for over 30 households who live 100 metres downhill and collect their supplies in buckets. In a country where booming headlines boast near-double digit growth, this may seem primitive. But the families here are actually lucky, and certainly better off than the Chinese government's estimate of 360 million people who lack access to safe drinking water. Beijing says 70% of China's rivers and lakes are polluted - and more than 100 cities suffer from extreme water shortages. The Qingshuixi provides a classic example of what China's authorities are up against. Once out of the trees, the stream runs through Shandong - a low-income, hillside suburb of Chongqing. Few homes have running water. The locals do their laundry by a natural spring pool, which also serves as a reservoir. 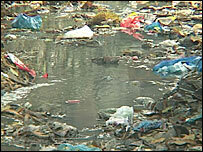 And the waste water, sewage and other garbage end up in the Qingshuixi. After Shandong, five other brooks join the "pure stream" on its 17 km-long journey to the Jialing River, which, in turn, flows into the Yangtze River less than 10 km away. The Qingshuixi's catchment area is 30 sq km, with a population of 300,000. The Yangtze, on the other hand, is the main water resource for one in 12 people on the planet. Yet, according to environmentalists, a quarter of its 207 tributaries are not fit for spraying on the fields. And the Qingshuixi is one of the worst. "Sixteen million tones of domestic waste water and one million tonnes of industrial waste water flow from the Qingshuixi into the Jialing River annually, " said Wu Dengming, president of Chongqing's Green Volunteer League. 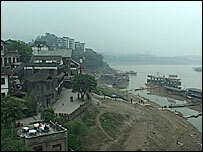 Further downstream, just 3km from the source, the Qingshuixi weaves around Shangqiao, where Chongqing's industry begins. It is easy to see the oils, acids and electrolytes of the local mechanical engineering companies. Unofficial tests indicate high levels of coliform bacteria. 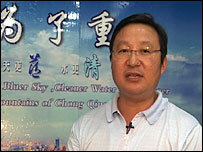 "This is the first big contamination," explained Wu Dengming. "It's so easy to see the pollution. Qingshuixi used to be called the clear stream - not any more." By the time it reaches the Jialing, when the main river level is high, the Qingshuixi's outlet is a bubbling, putrid pool of defecation and chemicals. Overlooking this scene is the old, restored town of Ciqikou. With its restaurants and art galleries it is a key tourist spot. While just offshore, floating tea rooms and restaurants vie for trade - as the matter floats by. It is little wonder that tap water in downtown Chongqing contains 80 of the 101 pollutants forbidden under China's new regulations, according to the official state media. Prior to the summer of 2005, the authorities were obliged to test for only 30 categories. And as coliform, the main indicator for raw sewage, was not included, it was easier to claim that water supplies were up to standard. Chongqing's challenge is particularly acute because of the Yangtze's Three Gorges Dam, 350km downstream. Come 2009, when construction is complete, this stretch of the river will be a huge reservoir, and the natural flushing action of this huge artery will slow. So, to prevent creating the world's biggest cesspool, Chongqing is spending over $5bn on pollution treatment infrastructure. "After building more than 100 waste water and garbage treatment plants, we'll be more capable of dealing with our pollution and should be able to treat more than 70% of our waste water," said Cao Guanghui, director of Chongqing Environmental Protection Bureau. Currently, an estimated 80% of Chongqing's waste flows into its rivers untreated - over two billion tonnes annually, or four tonnes every minute. Across the country, the Chinese government is keen to attract foreign technology and cash to build and operate water supply and sewage projects. Official statistics show that investments in the great China clean-up are expected to exceed $60bn. But the Yangtze is also polluted by fertilizer run-offs from farmland along its steep banks. And it suffers from some 30,000 vessels that operate on the Three Gorges Reservoir area - including more than 100 passenger ferries and tour ships. An estimated 90% of these boats dump their waste straight into the water. "It's quite frightening," said Wu Denming. "According to some statistics, the amount of liquid sewage drained into the Yangtze River here from the ships each year is about 15 million tonnes." The government, anxious to avoid an environmental and financial disaster, has ordered that all boats should either stop discharging in the river or be able to treat their waste beforehand. The latest on-board treatment equipment costs $5000 for a 15-person boat; while larger ferries that carry 200 people need to spend up to $30,000. So business opportunities exist. During Chinese President Hu Jintao's recent visit to Europe, much was said about the country's peaceful rise and its place in the world economy. But at home, the 1.3-billion population is paying a high environmental price for a decade of rapid development.